After having travelled through several countries of West Africa we had arrived in Lome, the capital city of Togo. Lome is the largest city in Togo and the commercial hub and economic center of the country. Lome is located in the south of Togo right there where the African continent borders touches the waters of the Atlantic Ocean. Thanks to its position and proximity to the other countries of West Africa, Lome has florished as a city of commerce where everthing is being shipped to and everything is for sale. Walking through the streets of Lome was like looking at a surreal movie where all scenes surprised me and slowly flashed by without me realizing exactly where I was and what was going on. Strong women smiled as they carried their heavy load upon their heads not losing ever their balance, kids were jumping in front of our camera's wanting to play and the market salesmen yelled for our attention hoping to sell some of their crafts. It was a busy day at the Grand Market of Lome and my eyes were drawn in a million different directions. But the real cultural shock didn't kick in at the Grand Market as it was just an introduction to the Togo culture. The Fetish Market of Lome is another known market in Togo as it is the largest fetish market in West Africa and craftsmen from all over this part of the african continent come here to sell their curious and sometimes lugubrious items. From voodoo dolls to chopped off animal heads and tails, the Fetish Market of Lome won't be of help if you're looking for cute souvenirs to bring back home! Let's just say that it was a very surprising visit but for who is looking for a more relaxing stay in Togo, the beach is probably a better option. Beaches like Coconut Beach and Lome Beach are great getaways from the city center and the renovation of the area around these beaches makes it also a popular part of Lome to look for accomodation. Did you enjoy Lome Grand Market and have you been on a holiday in Lome, Togo? Where to stay in Lome: Near Coconut Beach or Lome Beach. 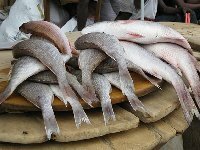 What to do in Lome: Relax on the beach and enjoy Lome's markets. Liked: The whole experience was so shocking it became interesting. The Grand Market on the other hand is worth a visit. Disliked: The Fetish market was different..